Welcome to a brand new blog post! I thought that today, I would talk to you all about the new vendors that are at Trinity Leeds at the moment! Trinity Kitchen is an open plan food court that is situated within the heart of the well known shopping centre, Trinity Leeds, which has a plethora of stores ranging from beauty to children's clothing. Trinity Kitchen has a range of vendors that are full time residents such as Tortilla, Pho and Chicago to name a few, but TK also bost a range of independent vendors that stay for a time period to showcase their food to the people of Yorkshire. 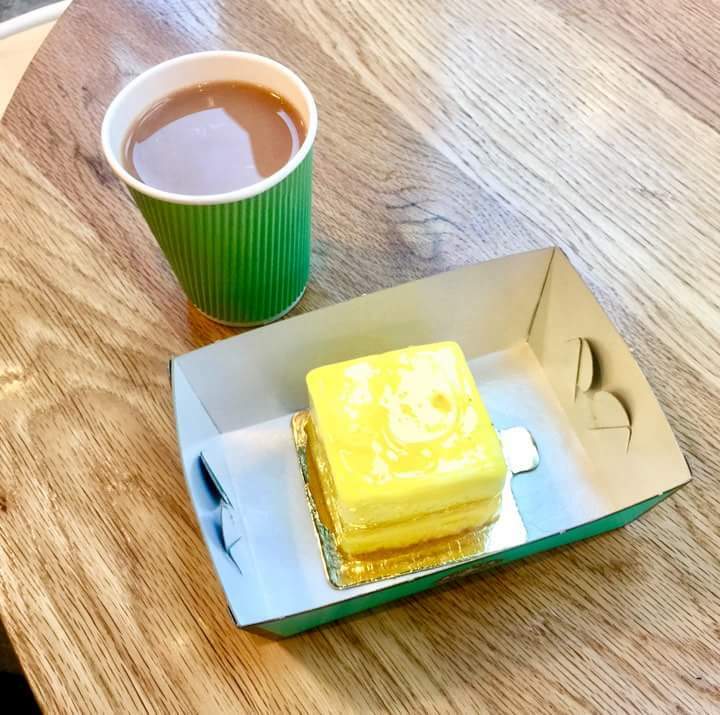 A square bright yellow cake in a rectangular white on the inside, light blue on the outside box with a coffee cup filled with light brown tea on a light golden brown wood rectangular table on a light background. The first vendor that I tried out was Mr D's Magnificent Pie Machine. This vend or already sounds like a savoury sub-company of Wonka just from the name and they don't disappoint when it comes to their food. Mr D's serve delicious Pies but ensure that they are all jelly-less, which I love due to finding that some mass produced Pies end up being gelatinous which then puts me off the pie a bit. Mr D's offer a plethora of flavours ranging from the humble Sausage Roll all the way to luxurious Game Pie. I also loved that they had quirky flavours on offer such as Pork and Black Pudding and Pork and Chilli. I decided to go for a jellyless Pork and Apple Pie. I made the right decision doing this, I love Apple and Pork so I knew that I was going to like it, but oh my god I took that first bite and I was in heaven. The pastry was slightly flaky but crunchy around the crust which is the best type of pastry. 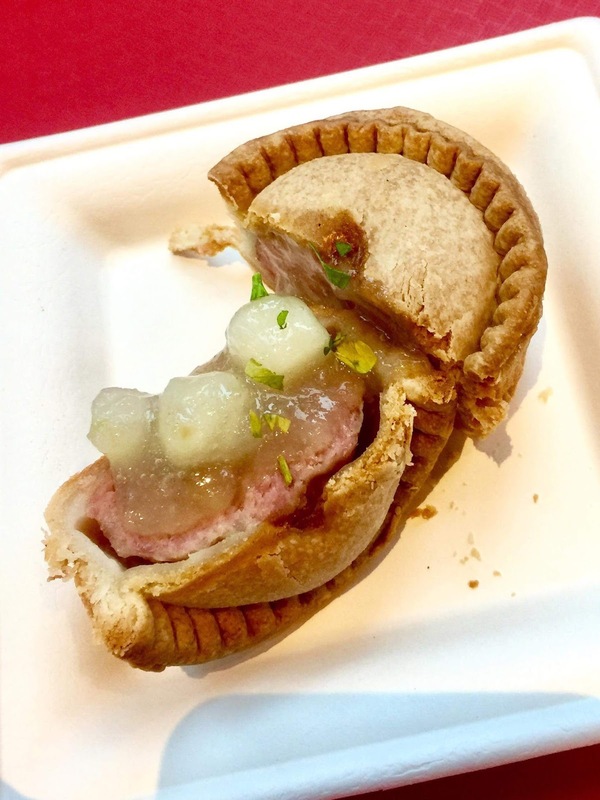 The filling was packed full of meat and chunky Apple Sauce which I loved not only for the taste, but for the texture, as the flaky pastry against the bits of meat against the flowing sauce was just amazing. I'd definitely get one if you're in Trinity Leeds as they're delicious as a light snack or a meal with some of the sides that they offer. It's hard to find a pastry business that makes me want to scream that I'm from Yorkshire, without mentioning a certain name that ends with egg, but these definitely make me want to scream that I'm from Yorkshire. Two semi circles of light golden brown pastry containing pieces brown cooked Pork with a pale green Apple Sauce all on a white rectangular plate on a golden brown wood table on a light background. After the amazing pie, I made my way to the Trough Foods vendor to try some of their amazing food. They focus on all things meat ensuring that the best is going into your mouth. I tried a Pulled Pork Mac & Cheese topped off with Apple Sauce. I thought that i might as well as carry on the theme! I rarely eat Mac & Cheese due to my lactose intolerance, but I thought screw it I might as well! The sauce was creamy, thick and tasty but not too Cheesy as sometimes in Mac and Cheese, it can make the dish a little bit sickly. The meat was fall off the bone tender and I adored it in the Mac & Cheese, as it just gave a different taste to the dish as a whole and the apple sauce was amazing. It just cut through the richness of the meat and sauce and just lifted the dish to another level. 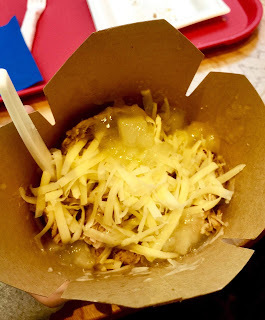 A cluster of bright yellow Macaroni and Cheese with dar brown pulled pork layered on top with a pale green dollop of Apple Sauce all within a light brown square takeout box on a light brown wooden table on a bright background. The last vendor that I decided to check out was Meli Patisserie. i have talked about them before on the blog, but I wanted something sweet to round off the lunchtime meal so i decided to pop around and enjoy a Lemon Cake as their cakes and patisserie products are to die for. (They do a range of cakes and sweet treats including everything from Baileys Cake to a Strawberry Tart.) The Lemon Cake consists of a deliciously sweet White Chocolate Mousse, with a layer of smooth Lemon Cream which is all draped in a zesty Lemon glaze. I chose this one as I wanted something refreshing due to the slightly drab weather that surrounded Leeds. i received a complimentary cup of tea with the cake, which is always an amazing thing in my opinion, as I grabbed it once I ate the cake and drank it around Leeds City Centre. If you love Cake, Tea or anything sweet then check them out! Have you tried any of the vendors, old or new, from Trinity Kitchen before? Let me know down below! Thanks to Trinity Leeds for inviting me to come down and try the amazing new vendors at Trinity Kitchen. Please do check them out if you live anywhere near Leeds. I hope that you have enjoyed this food based blog post and I hope to see you next time for another blog post! This post was in return of goods or services. All views, opinions and ramblings are my own.